Today we went for a leisurely drive in the cool coastal mountains of Latakia. The sights from here are truly breathtaking! As we climbed the mountains we got to take in a panoramic view of the city and its deep blue lakes and golden and green countryside. Once when we stopped to get a close-up of the scenery we were spotted by a Syrian family who invited us to their house to share chai (tea) and stories of our trip. Jalal Abu Mohammed, a minibus driver, and his family were charming and typical examples of Syrian hospitality at its best. We took photographs together and promised to keep in touch with our new found friends before we bid them farewell and continued our journey. It was a truly memorable experience and a highlight of the trip. As we continued our course we kept seeing roadside cafes and people selling fresh fruit and vegetables. We decided to take a pit stop and sample some of the hot bread the women were baking in clay ovens. The bread was a bit like pizza since it was topped with tomato paste and cheese and seasoned with hot spices - it was delicious! We then made our descent to our hotel to get ready for interviews with Syrian TV reporter Dimah Mohammed. She was a lovely lady and made us feel instantly comfortable as we told her of our impression of the country and the purpose of our mission. 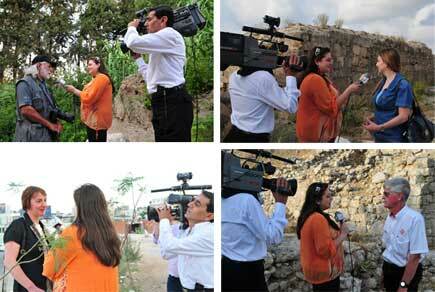 The interviews were conducted at several historical sights of Latakia including the city of Ugarit. The site dates back to 14 BC and contains tombs, shrines and two temples. After the interviews we headed back to our hotel for dinner and then some of us returned to the town square to take in the atmosphere of another night of the street party. Teenage boys dominated the scene as they danced Arabic style to Syrian music. A couple of them spotted Ammar and Taha and invited them to join in the action. It was a wonderful way to end a perfect day.